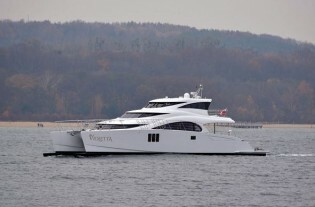 New Sunreef 70 Power Yacht VIOLETTA launched – Superyachts News, Luxury Yachts, Charter & Yachts for Sale. 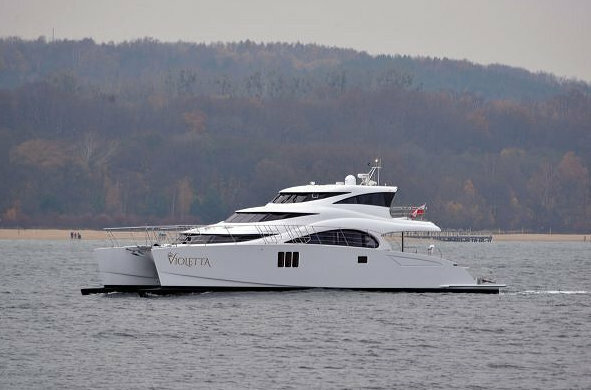 A unique power cat in terms of design and equipment, motor yacht VIOLETTA boasts powerful IPS propulsion, wave-piercers, a hydraulic aft platform and a rotating gangway, to name but a few. Design-wise, she is modern, minimalistic and monochromatic – the use of rich white tones, glossy and mat interchangeably delivers a great abundance of natural light to the space, which makes the vessel a soothing, uplifting place to be. One of the many remarkable features of the newest Sunreef 70 Power VIOLETTA yacht represents the lofty enclosed flybridge. This provides not only space for a prime navigation station, but also vast leisure area that socializes with the balcony – ideal for open air dining.